Over the past many years, more and more people have been depending upon large utility companies for electric power; with the result these companies always dictate terms. In view of this, there has been constant search for alternative sources of electricity. 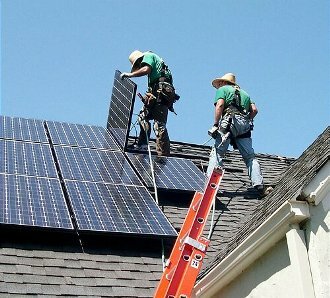 In this respect, installing a solar power system at home is much more advantageous than carrying on with large electric companies for electricity or depends on “fossil fuel”. The major advantage of having a solar energy system at home is reduced costs of electricity. All the leading utility companies frequently increase costs of power and unfortunately, the individual consumer has no control over it. Installing a solar energy system for a home reduces considerably reliance on large electric companies for power. Solar energy sources have become so popular these days that many people have already got solar panels installed in their residences. A house with a solar panel system will, therefore, enhance the value of the property. This is another significant benefit of having a solar panel system at home. Houses need various types of repairs from time to time. Home repairs, normally, consist of changing broken windows, rectifying leaking taps or valves or repairing screen doors and many similar repair jobs. The need for household repair jobs usually occurs all of a sudden and most of them need immediate rectification. However, unlike installation of solar energy systems at home, these repairs will not add any value to the house. Besides repairs, there are several maintenance jobs at home which need to be undertaken from time to time. Some of these maintenance jobs include for example, changing water filters in a water purification system, cleaning gutters or putting a sealant on a wooden portico. Home maintenance jobs are carried out normally every year based on a specific plan to derive the best service from that item. Just like repairs, home maintenance jobs do not also enhance the value of the house, whereas including a solar panel system as part of house hold equipment will boost the value of the house. Extending the house by adding another room, installation of a solar power panel or adding storm windows are in the nature of home improvements. Although these jobs are not so vital, many people still undertake home improvements now and then either for their convenience or because of certain advantages these items would provide. Solar power is eco-friendly and renewable energy source. Minimizing air pollution is another excellent benefit that a solar panel system can offer. Fossil fuel emits harmful greenhouse gases and pollutes the atmosphere. Air pollution is reported to be the major cause for global warming. In certain areas, the air pollution is so serious that numerous instances of breathing difficulties and asthma are frequently published in newspapers and scientific journals. In other words, minimizing pollution not only contributes to pollution-free atmosphere but also improves overall well-being of people. Most of the local regulations do not impose any restrictions on installing solar energy systems for residences as compared to installing a wind turbine. Wind energy is another alternative source of cheaper, renewable and pollution -free electrical energy. Erecting a windmill, therefore, appears to be a good option for generating affordable and clean energy. However, the advantage with a solar panel system is that it can be easily erected on the terrace where it will not cause any obstruction. On the other hand, installation of a wind turbine requires a lot of open space and this aspect may invite objections both from local regulators and neighbors. Installation of a solar energy system for a residence is a major decision. Luckily, State as well as Federal agencies offer normally several concessions to assist in reducing the cost of erection of solar panels for the residence and therefore, it is one more advantage of having a solar panel at home. Department of Energy makes available a lot of information relating to the policies of Local, Federal, Utility and the State administrations and on various incentives offered in order to promote renewable energy and energy efficiency. Over a period of time, solar energy is likely to be the norm in future, when all these rebates may be withdrawn. In view of this, installing a solar panel system for the residence at present is an excellent investment decision. Hence, it is a sound strategy to install solar panels at home and reap all the advantages immediately.